Good quality shiplap bike store. The perfect place to store your family's bikes or for general storage. Solid, large double doors for easy access with a pad bolt included. Solid sheet floor and roof with quality 12mm tongue and groove clad walls. The mineral felt-clad apex roof prevents water getting inside. 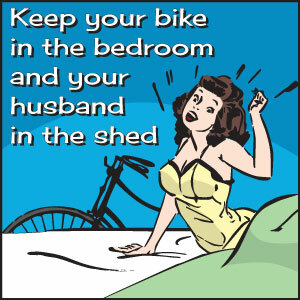 Home sweet home for your bikes! The Mercia Shiplap Bike Store 7x3 is perfect for up to 2 adult bikes with wide double doors for easy access. Can be easily tucked away at the side of your house and is ideal for the smaller garden. The Mercia Shiplap Bike Store 7x3 is supplied pre-treated with a water based timber treatment for protection during transit. In order to receive the full 10 year anti-rot guarantee, it is necessary that you treat the shed with a high quality, spirit-based, timber preservative prior to or shortly after construction. his will protect the timber from weathering and will need to be repeated as per the manufacturer’s instructions. Please note should you opt for the installation service, this will be arranged within 14 working days from the date your building is delivered.